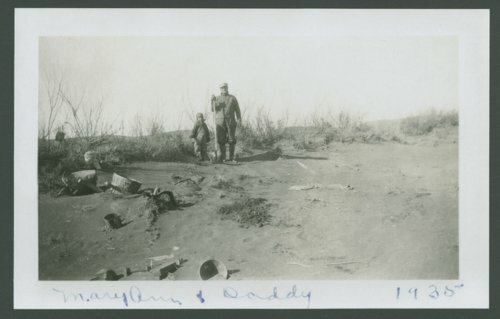 Here are eleven photographs showing dust storms, dust piles, and structures on Roy and Minna Taylor's property in Page City, Kansas. Mary Ann and Dotty, the Taylor's children, are in the photographs. Also, the Page City school and road equipment used to build Highway US 40 are visible in the photographs. Roy Taylor worked as a cook and custodian at the Page City school and helped build Highway US 40.